Kannywood is currently mourning popular actress, Hauwa Maina who died yesterday at the Aminu Teaching Hospital (AKTH) in Kano, after a lingering illness, she will be buried today Thursday, 3rd May 2018, in Kaduna. Confirming the death, another popular Kannywood actor, Ali Nuhu, told Premium Times the celebrity died at the hospital after an illness. “Yes, Hauwa Maina is dead,” Ali Nuhu said. Many Kannywood celebrities have condoled with the family of the deceased, posting her pictures on social media and praying for the repose of her soul. Hauwa Maina will be buried in Kaduna on Thursday. The actress starred in a lot of Nollywood movies achieving superstar status in Kannywood. One of her iconic roles was as Queen Amina of Zazzau. She has won awards including best actress SIM awards 2010, best Afro-Nollywood Award, London (2007). The late actress, who was born in Kaduna State, hailed from Biu, Borno State. She did her primary school in Kaduna and Geidam, Yobe State. She completed her secondary school in Nguru, also in Yobe State. She obtained a National Diploma in Management from Kaduna State Polytechnic. 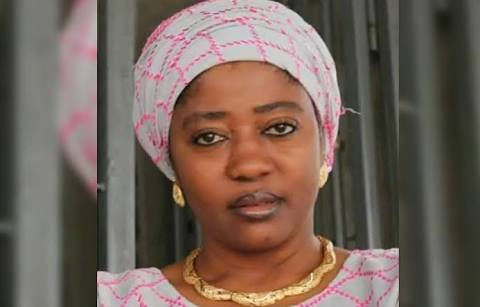 She is survived by a daughter Maryam Bukar Hassan, a famed poet and an Information Technology graduate from Radford University, UK.